Construction sector has maintained a significant role for Turkish economy in recent years as house prices in mega cities have skyrocketed and government sponsored large projects have been under way. Now with the economy sending signals of slowdown, we not surprisingly saw some attempts to boost the industry which has been at the forefront of the country’s recent economic development. Other than transforming the skyline of Istanbul, ─admittedly not many residents of the city take a fancy to this─ this may have some unexpected and unintended implications for the economy. Not to mention the bubble it has created and possibility of economy toppled once it bursts, we currently observe strange findings in the financial space. 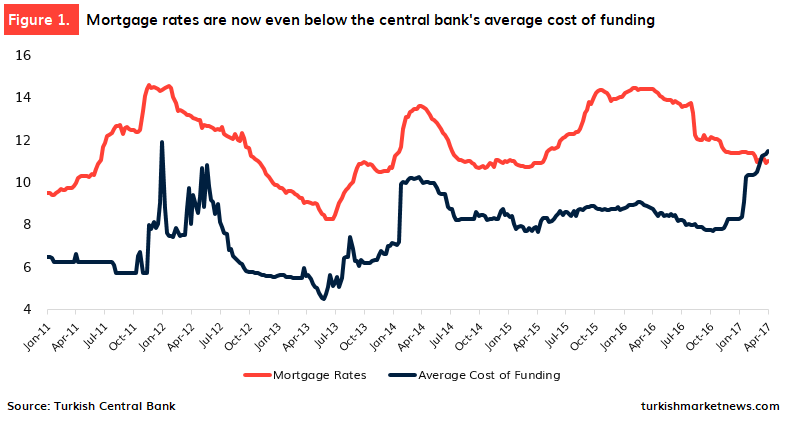 First, Turkish central bank has increased its average cost of funding rate, in other words the effective rate, via some unconventional methods such as acting solely as a lender of last resort rather than a central bank. Meanwhile, mortgage rates have kept falling like dead leaves and now the average rate for the mortgage production is lower than the effective rate the central bank implied, which means Turkish banks provide mortgage loans at a loss. While banks are able to offset the loss via some fees and cross selling activities, we see it as long-term risk as rates are set to be higher in the upcoming period that would leave lenders with significant interest rate and liquidity risks. Please note that banks in Turkey are still not comfortable with the funding side. So, the question may arise as to which segment of the banking records high origination activity recently. It comes as no surprise that state-run banks again take the lead in mortgage market and outperforming the rest of the industry by a wide margin. 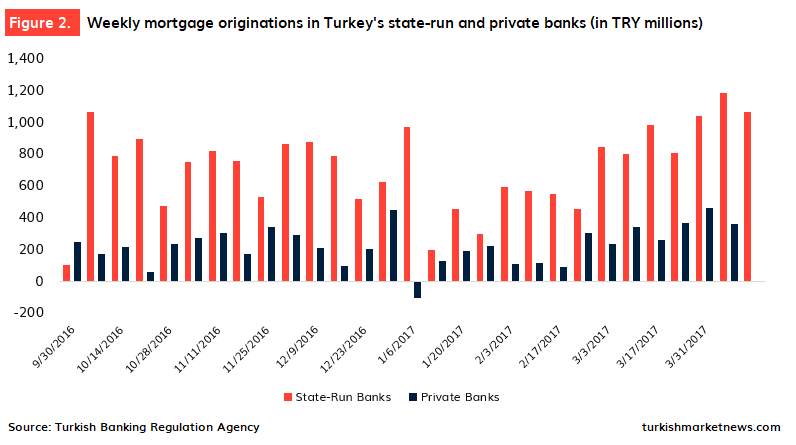 With naysayers in the banking community now having the upper hand across the board, one would imagine the conservative and high quality underwriting standards and solid risk management in Turkish banks where regulations have been extremely strict but functioning well, but not, likely as a part of the ongoing “structural deform” process. 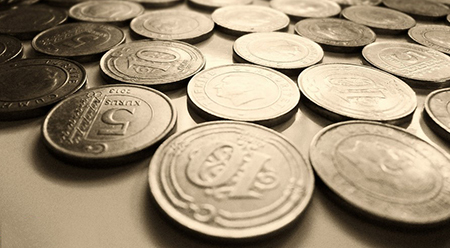 Next Article Credit Guarantee Fund: Will It Juice Economy?